Home / Kentucky Derby 2017 / Kentucky Derby 2017 – Who Will Hit The WIN ZONE? What is this Year’s Kentucky Derby Win Zone? SPEED ZONE – Win Zone 1 features Kentucky Derby winners that were on the lead or within 3 lengths of the lead heading into the far turn. These are typically pace and presser types and a few early closer types. Note that about half of the past 23 winners including last year’s winner, Nyquist, fall into this Win Zone. TRACKING ZONE – Win Zone 2 comprises Kentucky Derby winners that were in touch with the field sitting just 5 to 7 lengths off the leaders as they approach the final turn. One third of past 23 Kentucky Derby winners were part of this Win Zone. DEEP CLOSER ZONE – Note the big gap between Win Zone 1 and Win Zone 2 of almost 5 lengths, plus, how relatively few winners there are in the Deep Closer Zone. While plenty of horses that finish 2nd, 3rd or 4th in the Derby come from the Deep Closer Zone only 4 Derby winners in the past 23 years were this far back coming into the far turn. It takes some very special circumstances such as a huge pace meltdown, an extreme track bias or an inferior field to set it up for a come-from-the clouds type winner. PACE MAKES THE ZONE – To help explain the “why” of the three separate Win Zones, we turned to pace analysis for some clues. When you average the 6-furlong running time for races (excluding some outliers) won by horses in each of the three Win Zones, you see an expected pattern emerge. On average, “up close” winners in Win Zone 1 encountered a modest average 6 furlong time of 1:11. Win Zone 2 winners sitting more mid pack took advantage of a swifter average 6 furlong time of 1:10 3/5. Lastly, though observations are few, our deep closers in Win Zone 3 were part of a pace collapse with Giacomo and Orb finding sub 1:10 6 furlong fractions much to their liking. Also, Mine That Bird and Orb ran on tracks that can best be described as sticky and tiring due to surfaces that took on a lot of moisture. HEAD OUTSIDE – Heading into the far turn, over 80% of the past 23 Kentucky Derby winners were positioned 3 to 5 wide. This enables the horse to stay out of the way of speed horses backing up on the inside and secure a sustained, uninterrupted run around the turn and into the stretch despite covering extra ground. Note that all three Derby winners coming up the rail were ridden by none other than Calvin “Rail” Borel. A jockey that was infamous for painting the rail with his mounts in an effort to save as much ground as possible. From What Zone will this Year’s Kentucky Derby Winner Come? Having the ability to project the likely Kentucky Derby pace scenario is key to understanding which Win Zone will be in play. Also, it is critical to be able to isolate the impact of the projected pace on all horses in the field to determine which contestants will thrive and which will wilt. The Kentucky Super Screener sorts this all out for you by projecting the likely Derby pace scenario and evaluating each horse and how their natural energy distribution profile will match up to that projected pace scenario. Which Win Zone will apply for this year’s Kentucky Derby? 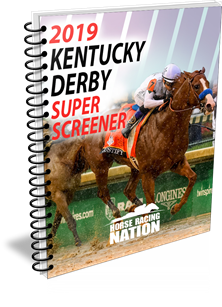 Order the Kentucky Derby Super Screener now to get into the Win Zone. Get Kentucky Derby Super Screener TODAY! Next Story → Always Dreaming Tops Kentucky Derby 2017 – Results!